I am really addicted to the Mexican recipes these days. 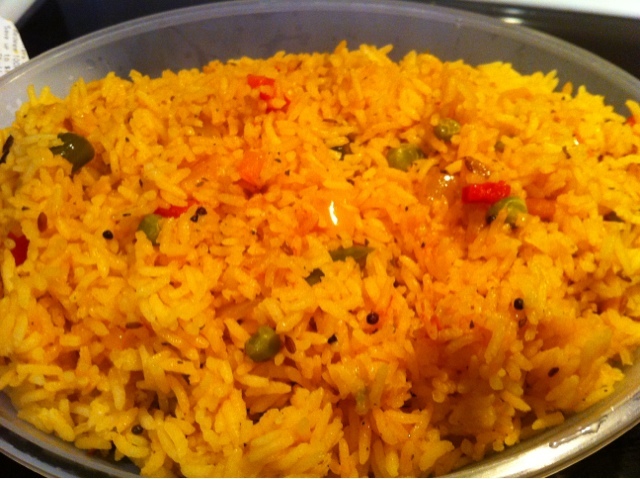 Few days back I tried Mexican rice and they turned awesome, now I just tried the same recipe in Indian style. From past month I have been making one pot meals for my hubbys lunch box, which are very simple and delicious recipes. 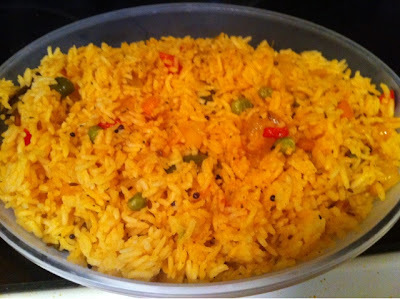 Similarly, I tried this today, and just now I got a phone call my hubby telling that the rice is fantastic!!! This is the best compliment that I have ever heard from my hubby, he is a bit inexpressive tells about the recipes unless you ask him!! But today to my surprise he called and told me about it!!! :) Now stories apart coming to the recipe..
Wash rice and add chicken broth, water and salt (remember chicken broth already contains salt so better be careful). Now take a skillet and add butter/olive oil and heat it. Add cumin seeds, mustard seeds and allow them to splatter. Then add cardamom, cinnamon, cloves and bay leaf, saute under medium flame. Then add onion, green chili and cook till the onion turn tender. Then add capsicum and green peas, saute for 1min(Do not over cook capsicum as they will cook well along with rice). Finally add tomato puree, pudina powder, coriander and cook till the raw flavor of tomato goes away. Shift this mixture in to the rice bowl and cook like you cook normal rice. Finally you can squeeze some lemon juice on the top, if you like tangy flavor. You can also add garlic in the seasoning if you wish. Hope you will like this recipe too!!! please come back again and do not forget to leave your valuable comment below!!! This is a perfect lunch recipe. Looks yummmmy. Delicious capsicum bath ,looks very tasty. Delicious and flavourful tomato and capsicum rice...yummy..